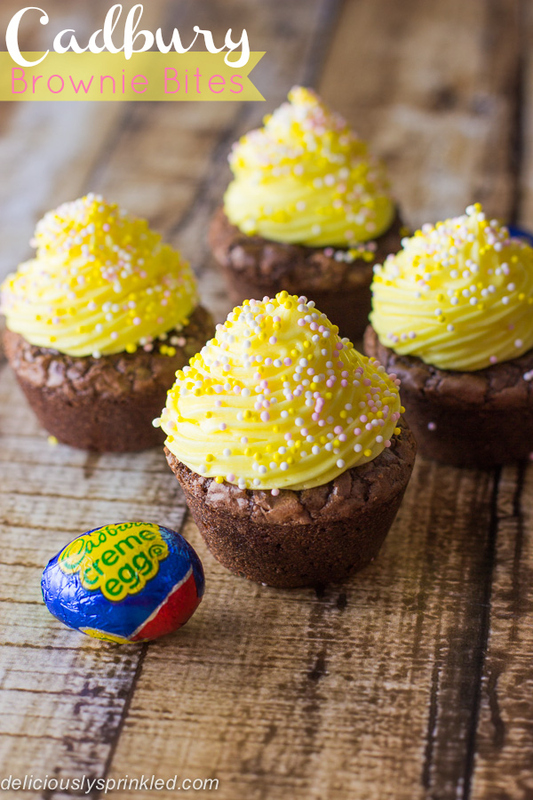 These Cadbury Brownie Bites are the perfect Easter brunch dessert! Although St. Patrick’s Day is today, I feel like we have been celebrating this fun, green holiday for a couple weeks now with my Mint Chocolate Chip Brownies, Grasshopper Pie, Mint Chocolate Chip Cookies, and Lucky Charms Munch recipes that we have been enjoying! It’s time to celebrate with some green beer before we are onto the next holiday/season with these delicious Cadbury Brownie Bites filled with a Cadbury Creme Egg and topped with buttercream frosting with SPRINKLES! Cadbury Creme Egg’s are my absolutely favorite Easter candy, if I could have a Easter basket filled with these yummy eggs I would be one happy girl! And these brownie bites are not only super simple to make, they’re a perfect Easter treat that I guarantee will be a huge hit! Mix the box brownie mix according to the package directions. Spray a mini muffin tin with non stick spray. Fill each tin with 1 teaspoon brownie batter. Bake at 350F degrees for 11 minutes. Remove from the oven and let cool 2 minutes. 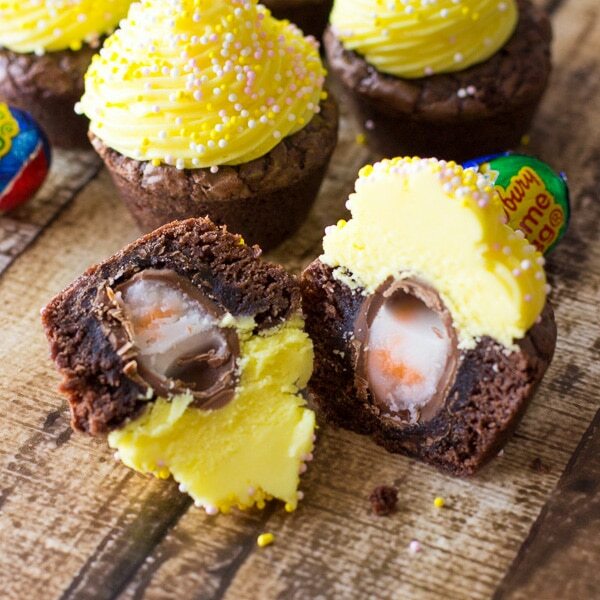 Press an unwrapped creme egg into the center of each brownie bite. Let cool another 2 minutes. Place on a wire rack and let cool completely. Mix the softened butter on medium speed with an electric or stand mixer. Beat for about 3 minutes until smooth and creamy. Add powdered sugar, milk, vanilla extract, and salt. Increase to high-speed and beat for 3 minutes. Add 4 drops of yellow food coloring and stir until fully colored. Frost cooled brownie bites (I used Wilton 32 piping tip) and sprinkle sugar sprinkles on top. * I frosted these brownie bites with a Wilton 32 piping tip. If you don't have a piping bag, no worries you can frost these brownies with a spoon or knife. Pingback: 16 Yummy Easter Brownie Recipes You Need To Try - Do You Still Hate Me? Hi Jenn, I couldn’t resist these yummy little bites and I’ve featured them on my blog, hoping that you don’t mind, but if you do, please contact me and I’ll remove it. All the best. Yummy! If I made these, I wouldn’t be able to resist eating the whole batch! Oh my goodness. I don’t even know what to say! I ADORE Cadbury Eggs. I might just licked my screen! You’re a genius, Jenn! 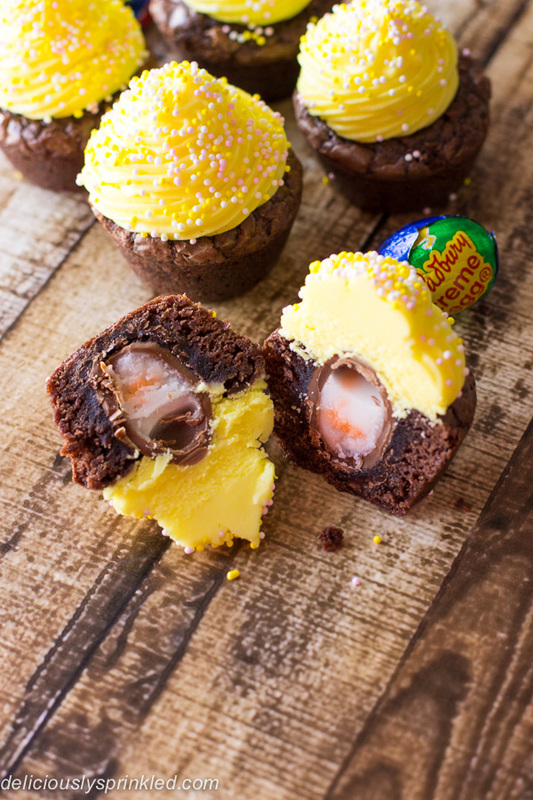 The best Easter candy in brownie form with frosting?! It doesn’t get any better than that! These are just TOO fun! So excited for Cadbury eggs 🙂 Pinned! These are adorable! I have totally been wanting to do this! I am also really glad you posted a Cadbury recipe so that when I post mine tomorrow, I don’t feel like I am jumping the gun LOL. Yeah for Cadbury Eggs! Jenn, you did it again!! These Brownie Bites are too cute and mouthwatering :). I totally agree with you – I am ready to bring on the Easter desserts and these Brownie Bites are an amazing start! This is pretty darn genius. Such a great idea for the kids for Easter! And it’s totally customizable too… I’m thinking of all different types of stuff I can hide in brownie bites now!! Yum! So cute! Look amazing and delicious! Oh my goodness! How cute! Pinned.